It is partnering with the Brighton-based charity TackleAfrica in funding a PhD student for three years to focus on the politics and production of evidential knowledge in sport-for-development. The student, Arthur Gaillard, is researching how sport-for-development initiatives are monitored and evaluated, and will identify ways of demonstrating programme effectiveness and impact. Arthur will spend two years of the studentship in West Africa and will have unprecedented access to the work of the West African operation of TackleAfrica, which uses football to deliver sexual health education to young people on football pitches across the continent. 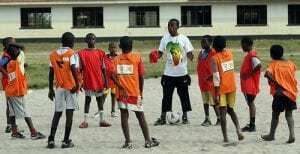 It trains African coaches to “use fun, interactive football drills with inbuilt health messaging with young people in their clubs and communities”. Sport is increasingly regarded as a tool in international development and sport-for-development is defined as the intentional use of sport and physical activity to bring about positive change in the lives of people and communities. The University already has expertise in sport-for-development – its award-winning Football 4 Peace has been operating in Israel, Colombia, Northern and Republic of Ireland, The Gambia, South Korea and South Africa since 2001, using physical activity, especially football and rugby, to help resolve conflict between communities. This project was featured in the recent Universities UK’s Made at Uni campaign as one of over 100 examples of universities improving everyday life. The new research is expected to have a direct impact on TackleAfrica’s future work and policies as well as the wider sport-for-development sector. Dr Thomas Carter, Principal Lecturer in the School of Sport and Service Management and the lead supervisor for the studentship, said: “The research will bring expertise into a sector that sorely needs specific research-related skills and knowledge. A university-NGO partnership can provide for the training, design and implementation of any evaluation of an NGO’s work that it might otherwise lack. This entry was posted in Football 4 Peace, Partnerships, Postgraduate study, Research, School News by Kerry Burnett. Bookmark the permalink.